You never know what treasures you can find in the bargain bin or at a Flea Market. In my case, my treasure was found at a flea market at a table being run by a fantasy arts, books and movies dealer. There was an awful lot of vampire related material there; no doubt because of the popularity of role playing games, books and, of course, the Twilight and True Blood series. Sadly, I’m not a huge fan of either series. I like my vampires to be either (a) scary or (b) played pretty close to the eastern European legends or (c) and this is the best part — scary and close to legend. I know, I can hear modern day horror fans cringing already. Who the hell watches old black and white horror films let alone a silent horror film? Maybe I am a romantic at heart after all but I love those old films. Max Schrek portrayed Dracula (called Count Orlock in the film) with incredibly orchestrated movements that still play eerily today. The make up is still top notch and if you don’t get a chill down your spine watching this movie then you may not have a spine at all or are paralyzed from the neck down. The film is just downright creepy and along with the classic Carnival of Souls and George Romero’s Night of the Living Dead remains one of the scariest black and white films ever made. F.W. 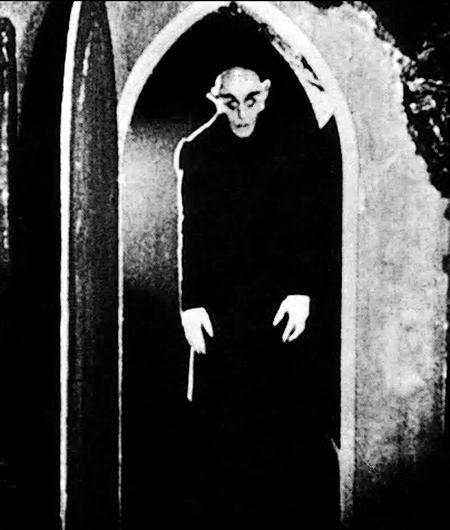 Murnau’s film, banned by Bram Stoker’s widow in a famous lawsuit over copyright infringments, has been digitially restored and has also been given a new soundtrack courtesy of the goth metal band Type O Negative. As an added bonus, the late David Carradine introduces the film. I know that you can find the original film with its grainy look and symphonic soundtrack on YouTube and Google video but Ive never owned my own copy of the film and I happen to like Type O Negatives music which adds a modern twist to the film. With the new musical score, its like watching a long music video. The music fits the film, especially Black No 1 and Christian Woman, and neither detracts badly nor overly commercializes Murnau’s finished product. 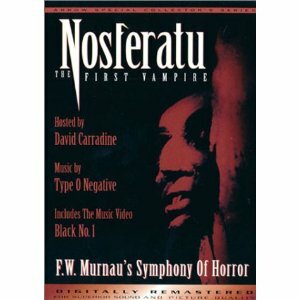 So, if you don’t mind movies without dialogue and enjoy reading placards instead (not to mention listening to the music of Type O) then you will find the new updated version of Nosferatu to be worth the money spent on it (in my case, I spent $5 bucks). This entry was posted on December 18, 2011 at 4:32 am and is filed under horror films, music. You can follow any responses to this entry through the RSS 2.0 feed. You can leave a response, or trackback from your own site.